ðŸ“šðŸ‘ I am delighted to announce that I am co-hosting a NEW online book club with fashion blogger Beth Djalali and award-winning mystery author Hank Phillippi Ryan called BOOK CLUB WITH STYLE! While building the successful blog, STYLE OF A CERTAIN AGE, Beth realized that many of her readers are also book lovers, so she decided to create a place where everyone could come together to meet authors and discuss books that cover a variety of genres and topics. Each month will feature a different book with monthly "live" online chats with the featured author. 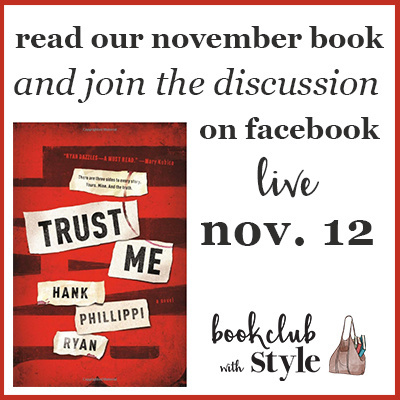 We're currently reading TRUST ME, the latest novel by our fellow co-host, Hank Phillippi Ryan. Hank will be leading the book club discussion of this novel on Monday, Nov. 12, on the clubâ€™s Facebook site. Please join us! Membership is easy -- simply join us here: https://www.facebook.com/groups/331045327647913 . Copyright Â© 2014 Kerstin March. All rights reserved.